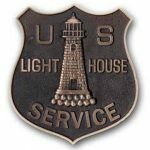 Lighthouse Keeper recognition ceremony August 18, 2018 – Chesapeake Chapter U.S.L.H.S. 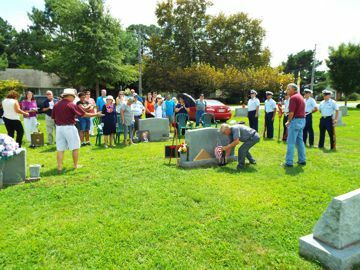 On August 18, 2018, family members of Barney Crockett Thomas gathered with two groups from the U. S. Coast Guard and members of the Chesapeake Chapter to honor another Chesapeake Bay lighthouse keeper. 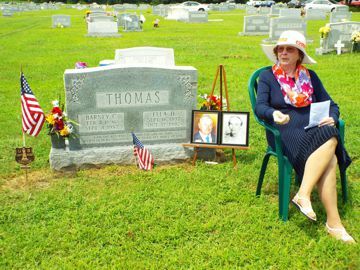 We were at the Thomas grave site in Fairview Lawn Cemetery in Onancock, Virginia on a warm and mostly sunny afternoon made tolerable by a gentle breeze. Chapter secretary Hobie Statzer and his wife, Winnie, along with my wife, Alma, and I arrived at the cemetery the day before to prepare the gravesite for Saturday’s ceremony and we quickly dug a hole for the concrete container holding the U.S. Lighthouse Service plaque and gave the headstone a quick cleaning. On Saturday descendants of Keeper Thomas began arriving at 12:30 pm and they were joined by members of the U.S. Coast Guard Auxiliary Flotilla 12-02 from Painter, Virginia—Vice Flotilla Commander John C. Pavlik and FSO Human Resources Ronald West. 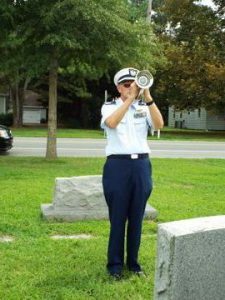 In addition, there were four Coast Guardsmen from the Cape Charles station who served as the color guard—SA Woodward, SN Biersteker, BM3 Wainglass, and FN Wilson. 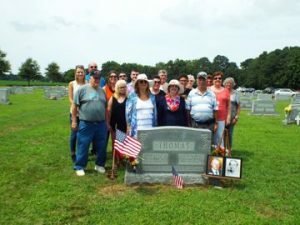 Chapter members at the gravesite included president and master of ceremonies Greg Krawczyk, advisory board member Betty Collins and her husband Ron, and Friday’s “ground crew”—Hobie, Winnie, Alma, and Vice President Tony. 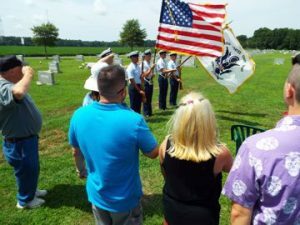 Greg began the ceremony with a warm welcome and the colors were presented by the combined Coast Guard Auxiliary and Cape Charles station. We recited the Pledge of Allegiance. Greg then made some introductions and listed the lighthouses served by Keeper Thomas. His first assignment in 1917 was aboard the Coast Guard cutter Apache. Not long thereafter, he became the third assistant keeper at the New Cape Henry Lighthouse. He further served at Lower Cedar Point, the Great Wicomico River Lighthouse, Solomons Lump, Ragged Point, Smith Point, and Upper Cedar Point. His final station was the Tangier Sound Lighthouse, an offshore screwpile located close to his home – Tangier Island. As Hobie and I unveiled the new U.S. Lighthouse Service plaque and “Keeper” insignia, we clearly heard a collective sigh of approval from the family. We then attached a small American flag to the shaft. The program continued with the reading of the Lighthouse Keepers Prayer. Two family members – daughter Violet Noda and granddaughter Kathie Brittingham then made touching remarks on the life and career of Keeper Thomas. The Coast Guard then presented the colors and as we stood at attention, FSO-HR Ronald West played “Taps”. Greg then concluded the 30-minute ceremony with some closing remarks, thanking all the Coast Guardsmen and family members for attending. 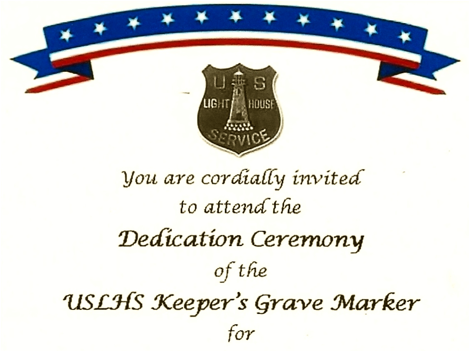 He also provided information on the Chesapeake Chapter and our U.S. Lighthouse Service plaque ceremonies. The color guard and Auxiliary were formally dismissed, and we met with family members as they gathered for group photos. There were 20 members of the Thomas family in attendance. Barney Thomas anecdote – During the family remarks portion of the program, we learned that Keeper Thomas and his wife, Ella gave birth to son, Everett in 1920 at his first station, New Cape Henry Lighthouse. He also frequently acquired fresh fruit, including a large supply of bananas in the off-season. The Thomas family then shared this unique bounty with other children and needy families on Tangier Island. Ella Thomas would also prepare food to help neighbors on the island. After 33 years of “light keeping” at eight different stations, Keeper Thomas retired in 1950 and enjoyed a long retirement. He “crossed the bar” in 1987 at 91 years of age. This ceremony marked the fourth time the Chapter has recognized the devoted lighthouse service of a bay keeper. Including the six keepers honored in April 2018, we have now paid tribute to nine keepers. Special thanks to VFC Pavlik, and FSO-HR/Webmaster West for their assistance and help in contacting BM3 Bryce Adams and then providing the Color Guard from the Cape Charles station. The officers from the Auxiliary also furnished a full cooler of cold bottled water. Great job by Greg “emceeing” another plaque ceremony. Hobie, Winnie, Betty, Ron, and Alma rendered vital help to make the ceremony proceed smoothly. Information from family members Kathie Brittingham and Sandi Trent greatly helped us in researching Keeper Thomas’ career. 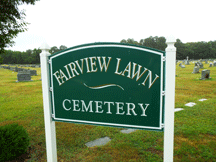 We also received assistance and information on Fairview Cemetery from Crystal Hart of the Williams Funeral Home in Onancock. The Chapter’s newest officer, Historian Jennifer Jones provided invaluable facts on Keeper Thomas’ lighthouse service, filling in several gaps in his biography. Thomas family descendants gather for a group photo at the end of the ceremony.